So the doctor says I have good news and bad news. The patient replies I can take it, give me the bad news first. And with that the writer of the blog post steps in and apologizes that he doesn’t have a good good-news/bad-news joke. And with that the readers left in droves. Of course that assumes there were droves to begin with, leading to the obvious conclusion that this whole narrative is entirely fiction. Except for the not having a good joke. Sorry, drawing a blank here. I do have bits of bad news and good news. The bad news is, dipped ice cream cones at McDonalds are history. Gone. Kaput. At least until next summer, kinda like the McRib I’m guessing. The good news is that dipped ice cream cones at McDonalds are history. Seriously, how much more weight would I have lost without those things being out there? It’s also good news because now there is nothing really compelling about going to McDonalds now. Chick Fil A? That’s another story. Have you HAD their new salads? wow. But I digress. Back to good news and bad news. 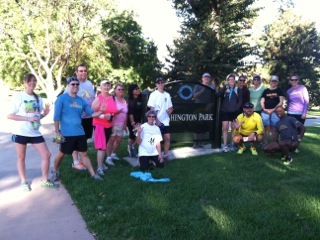 The good news is, it was a gorgeous morning for a run at Washington Park. It’s taper week, so we just did 5 miles. I know, I keep saying that but I LOVE saying “just 5 miles” and actually meaning it. I’m still blown away by that. I shaved about 3 minutes off my time from last time we ran there. I swear, Wash Park is one of the best parks for running. 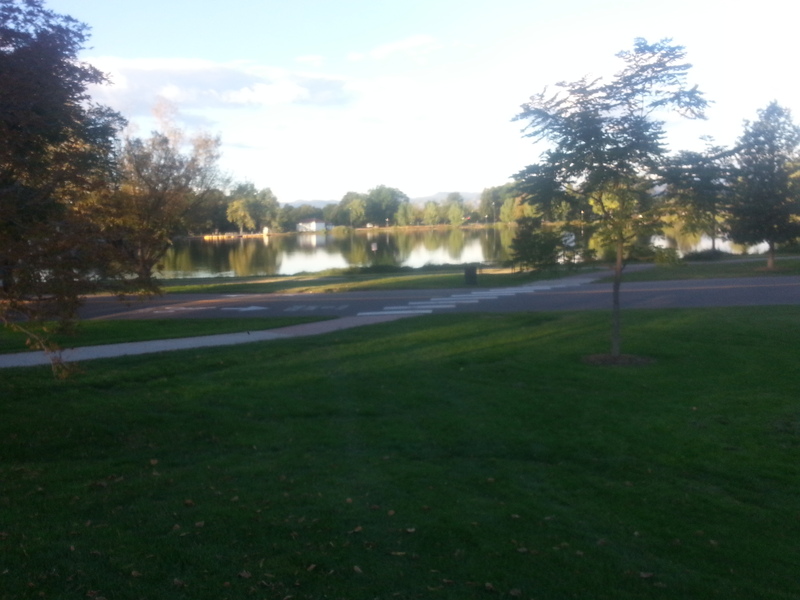 2 and a half miles of a nice composite running trail that’s well maintained and just a very pleasant view. An actual “After” pic of the crew, still standing and still mostly smiling. The bad news is I don’t really have bad news to go with this one. I know I ended up running keeping my eye out for clever things to write about and… nada. I mean I’m sure there was and I just wasn’t catching it. That’s probably not really bad news unless you are hoping to blog about something like that. I did have someone filming my feet somewhere along the way – someone was out with a camera at ground level. I thought of doing some kind of goofy skip or something. The good news is, it’s taper week. In one week is the Bear Chase half marathon. It’s hard to believe it’s already almost here. I’m getting a bit psyched about it to be honest. 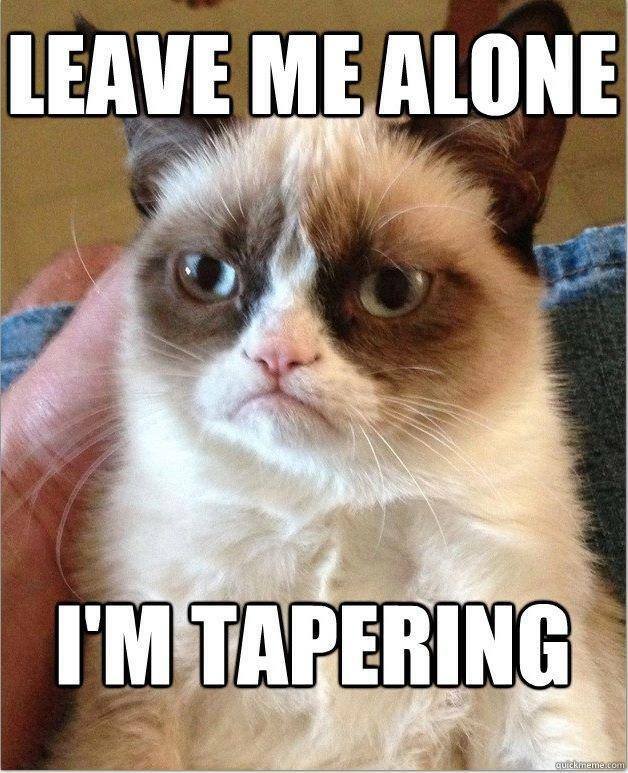 The bad news is, it’s taper week. Andrew, our coach, said that this week we’d be feeling fat and grumpy. That hasn’t happened really, but I am a bit bummed that it’s going to be over soon. It will be challenging to keep from doing too much. The bad news is, the trails at Bear Creek park where the race is next week had a lot of damage from the flooding. The good news is, they are able to do alternate routes and still have the race. This is probably really good news for our group – if there is one thing I was a bit concerned about is that all of our training was pretty traditional running on paved courses and the Bear Chase is a trail run with a number of water crossings. I’m not sure if we were really prepared for that. I have a feeling the water crossings will be a no go this year as Bear Creek is still quite high. The bad news is, my kids have The Three Stooges DVD on (the new one) right now. Sorry, there is no related good news for that one. Since I failed at providing any good news bad news jokes, do you have any to share? This entry was posted in Uncategorized and tagged Bear Chase, Good News Bad News jokes, half marathon, McDonalds Dipped Ice Cream, Taper Week, Three Stooges, Washington Park. Bookmark the permalink.